In recent years, senior living providers have debated whether a health care model or a hospitality focus makes more sense for the future — but this debate is shifting. Providers must inevitably offer more health care, yet they must do so without compromising the fundamental value propositions of the industry, which is rooted in a private-pay model focused on hospitality, executives said at the recent Senior Living 100 conference in Laguna Niguel, California. To increase their clinical capabilities, some senior living providers are forging closer collaborations with health care providers, while others are creating vertically integrated businesses that own larger portions of the senior care continuum. 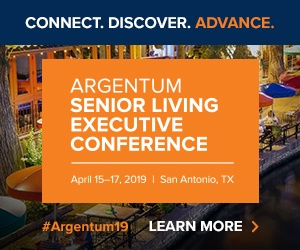 Meanwhile, senior living companies are trying to design and operate buildings to maintain a lifestyle-focused environment and keep their increasingly robust care services behind the scenes. The shift to a more health-focused model has been a long time in the making and has been driven by a variety of factors. These drivers include large-scale changes to the U.S. health care system meant to incentivize more coordinated care among different types of providers, as well as rising acuity within senior living settings. Larry Cohen recently retired from Dallas-based Capital Senior Living (NYSE: CSU) after about two decades with the company, and he believes the writing is on the wall in terms of what the future holds. Discovery Senior Living CEO Richard Hutchinson echoed Cohen, citing new health care payment models as well as resident needs and expectations. “We have moved down the path of trying to give a fully integrated, concierge lifestyle experience model, which — fortunately or unfortunately for our resident population — includes a fair amount of care,” he said. Discovery is based in Bonita Springs, Florida, and has a portfolio of about 50 properties that it owns and operates. And Kai Hsiao, CEO of Eclipse Senior Living, also acknowledged the necessity of moving toward a more care-heavy operational model. Lake Oswego, Oregon-based Eclipse has about 100 communities under management. “Can you go down that path? Yes. Will we go down that path? We’ll probably have to, because that’s where consumers are going to migrate from a needs standpoint,” Hsiao said. Recognizing the need for a more seamless blend of health care and hospitality is one thing — actually making it a reality is another. Doing so demands investment at a time when senior living providers are under serious margin pressure. For example, liability insurance costs are up, said David Eskenazy, president of Merrill Gardens. The Seattle-based company has a portfolio of about 40 communities. Taking on more responsibility for the health care of frail residents will only increase risks and costs, Eskenazy noted. Providers face other expense pressures related to tight labor markets, increasing regulation and new competition that is eroding occupancy and forcing rents down in some markets. “I’ve never in my career seen these price pressures,” Cohen said. Despite these financial constraints, companies are moving forward to create a variety of new hospitality plus health care models. One approach is to build partnership networks with home health, therapy and other providers. This is what Capital Senior Living did during Cohen’s tenure, as the company did not want to “dabble” outside its core competencies, he said. Eskenazy shared a similar sentiment. “I don’t want to do something I’m not good at,” he said. Discovery Senior Living, on the other hand, is providing more services itself across the care spectrum. Several years ago, the company acquired a home health agency, and more recently it brought Medicare Part B therapy in-house as well. Now, these clinical teams hold “more intensive” care coordination meetings than are typical in senior living, and they can manage the resident population more effectively than a coalition of third parties, Hutchinson said. Discovery does still partner with other providers in markets where it lacks licensure to provide care itself. In these instances, its care network partners agree to certain conditions, including being held accountable for quarterly outcomes. All these health care components of the Discovery operation need to “blend into the fabric of the community and not be what the community is,” Hutchinson said. To achieve this, Discovery Senior Living has packaged its clinical assessments and services as lifestyle offerings. For instance, it handles new assessments of new residents through a program called Fit Camp. When people first join a Discovery community, they participate in Fit Camp programming that approaches fitness from a wellness lifestyle perspective, while at the same time assessing balance and other key metrics. Discovery also created a care concierge role to track residents’ progress and offer personalized support. This fits into a larger goal that the company has, to not only enhance the resident experience but also to improve the experience of the adult child who too often is playing the role of de facto care coordinator, “running around and trying to figure things out,” Hutchinson said. One care coordination service is helping the consumer tap into all available services, regardless of payer. “I have my private-pay resources and my government-reimbursed resources, and all we’re trying to do is maximize that for the consumer,” Hutchinson said. In other words, Discovery Senior Living has no intention of moving away from private-pay senior living into a Medicare or Medicaid model. Still, Hutchinson is grateful to have perspective on the government payment systems through the home health and therapy businesses. This enables him to see how the Centers for Medicare & Medicaid Services (CMS) is driving consolidation in those sectors and moving toward payments tied closer to outcomes. Others are much less open to taking on any government reimbursement. This determination adds another tricky facet to adding more health care to senior living, raising the question of whether residents will be able to pay out of pocket for these services. Technology could be part of a solution, as well as providing more a la carte services, Cohen suggested. One thing is apparent: Coming up with the right balance of health care and hospitality in a sustainable business model will take time and experimentation. Senior living providers would be wise to exercise caution, in Hsiao’s opinion. “I think, let’s see how things evolve,” he said.